If you have access to some mode of social media, you might be having a very good idea of who Priya Varrier is. She became famous overnight due to her wink and the video had been doing its rounds over the internet for quite some time. She is lovingly called as the wink girl. There have been rumours that several Telugu filmmakers are waiting to rope in Priya p warrier for their films. There have also been reports that the actor will be playing the lead against Nani in an upcoming movie which will be directed by Vikram Kumar. The latest updates suggest that the Telugu movie makers will be adopting the wait and watch approach before confirming on roping in the actress for the movie. The debut movie of the actress, Oru Adaar Love is going to be released on the 14’th of Feb. The actress may be roped in after seeing the faring of the movie. The movie is being released in Telugu as Lover’s day. 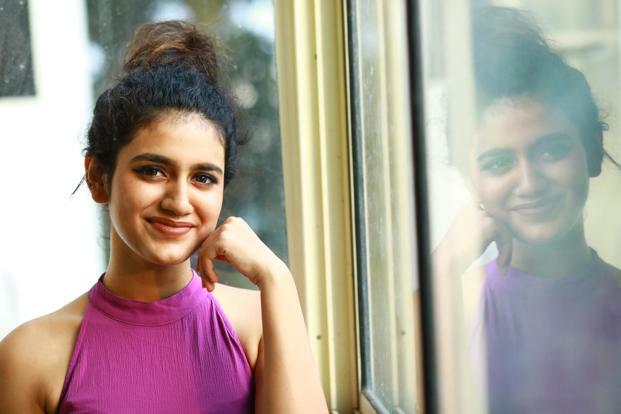 Even though the actress has already created a huge fan following for herself in social media, the producers of the movie are waiting to see how she clicks with the audience, especially the Telugu audience. It all now depends on how the movie Lover’s day will fare at the box office and how much Tollywood fans will be accepting her. The debut movie of the actress, Oru Adaar Love is originally made in Malayalam. It is in a sequence in the movie that the actress was seen winking at her classmate in school and this video had gone viral . The actress had suddenly become an overnight sensation on the internet and within a few days she had gained millions of followers on Instagram. The movie is being launched in 3 languages – Malayalam, Kannada and Telugu. The Telugu dubbed version being named Lover’s day and the Kannada Dubbed version of the movie is named Kirik Love Story. The Audio launch of the movie’s telugu version had happened in Hyderabad with Allu Arjun being the guest of honour at the event. The promotions of the movie in all the 3 languages are running at full force before its release. The movie is reportedly a campus entertainer which will be liked especially by youngsters. It is to be seen as on how the movie fares in Tollywood and how the Telugu filmmakers like the performance so as to see whether she will be seen in the forthcoming Telugu movies.